Before music took over my life, I used to be more into new technologies and was particularly keen on reading up on the latest mobile phones and angling after a way to get them. I went through all the best Nokias that came out – and looking back it seems crazy we all went so mad after the tiny 8310, surely it was too tiny. Anyway after avoiding the iPhone for a while, a demo by my cousin John at Xmas made me certain I actually wanted one. It was just too shiny not to get one y’know!! Of course, now I’m tied to an 18 month contract and will look on in anguish when the new version hits the shops in June! It’s been interesting to see what the other manufacturers are coming out with to compete with the iPhone and so I just had to go along when I was invited to the launch of the new LG phone ‘Secret’. 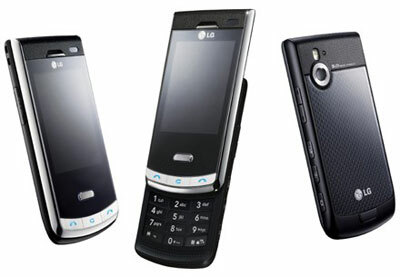 I’ve know of LG but not really very much about them or their phones, always having been a Nokia girl before. The launch was exclusively for bloggers and everyone apart from one other person seemed to be from technology blogs. I was looking at it more from a ‘style’ point of view, and if I were in the market for a new phone the LG Secret would be of interest simply because it looks good. I’m a sucker for anything shiny and it’s shiny black casing and flip down keypad oozes sophistication. The presentation made a big deal about how the phone was for aspirational clients – people who own or want to own BMWs, that type of thing, but then they said they want a large portion of their buyers to be students which seems a little odd. Does this look like a studenty advert to you? It’s out here this month and the UK has the first launch, so if you’re mad for getting things first you could be in luck. If you don’t want to part with megabucks for the iPhone then the Secret could indeed be a good alternative. It has a 5mp camera which seems really good but tends to overexpose everything, great video recording and editing functions (which you can’t do on the iPhone at all), the same turn the phone round and the photo moves with you thing (there must be a technical name for that), fun games that are Wii like – you throw a dart by using a throwing motion with your phone, and favourite of all shiny blue disco lights that show up when you press keys. My housemate currently has the phone in use, and is promising me a video or a report sometime soon so check back to see if it replaces Apple in our affections.